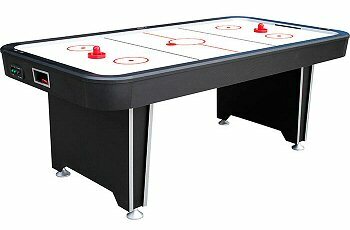 Our Mightymast 7ft Twister is a working full-size air hockey game for all the family. The powerful internal electric fan creates an air cushion on which the puck can move at high speed, helped by the high-gloss playing surface. Comes complete with all accessories. This table is a full-size air hockey table, representing great value for money. The performance is very good, and the table is sturdy enough for intensive play for up to 4 players.